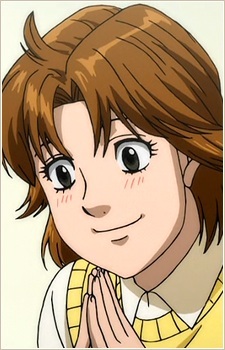 A 16 year old high school student at introduction, Nanako is one of Makunouchi Ippo's biggest fans. Because of this, she views Mashiba Kumi as a rival and competes with her at almost everything. She takes any chance to be around Ippo, and even tried to steal a kiss from him once when he was sleeping after a rough match, but she was interrupted by Kumi. Like her older brother Manabu she is very attractive, but she also has the same love for puns as the rest of her family. Imai Kyousuke is in love with her, but she tends to ignore his feelings as she has no interest in dating her brother's rival.